In a Nutshell: For retailers looking to expand, selecting a new store location can be a high-stakes proposition because of the questions surrounding ROI. With Esri, a business can look at data spatially, using geographic information layered with customer data to pinpoint locations with a sustainable presence of target consumers nearby. That data can also be used to quickly evaluate a property that is brought to a retailer by an outside party. Esri makes it possible for businesses to act confidently — and with the right data — to make expansion successful. And beyond the logistics of expansion, the company is looking to the future, leveraging its extensive background in GIS to help retailers map and optimize in-store traffic as well. Wawa, a Pennsylvania-based convenience store chain, had plans for a grand expansion. But despite its heavy northeastern presence — with hundreds of stores in Pennsylvania, New Jersey, Delaware, Maryland and Virginia — Wawa was looking at a much different market: Florida. Expansion can be a risky prospect, even for established retailers like Wawa, as miscalculating anything from market share to competitors in the area can be the difference between success and failure. Determining the best path forward takes patience, decisiveness, and lots of data. For those reasons, Wawa sought out Esri, the geographic information system (GIS) software specialist, to chart a path forward. Esri’s ArcGIS platform helps retailers understand data in a geographic sense by allowing them to create detailed maps using their own customer information or the vast amount of data Esri has accumulated. Wawa used its data and Esri’s powerful map layering capabilities to find large pockets of its target customers all the way down in Florida. It was able to leverage that information to find ideal new store locations, down to the best corner of an intersection for traffic flow. Layering insights atop area maps, retailers can better understand their markets. So whether a retailer wants to know if a new location is sustainable or search for opportunities to expand into new markets, Esri’s ArcGIS makes that data quickly actionable. We spoke with Gary Sankary, Head of Industry Marketing Strategy at Esri, about the platform’s capabilities. Expanding a network of stores always comes with some risk and ROI can take years to ascertain. 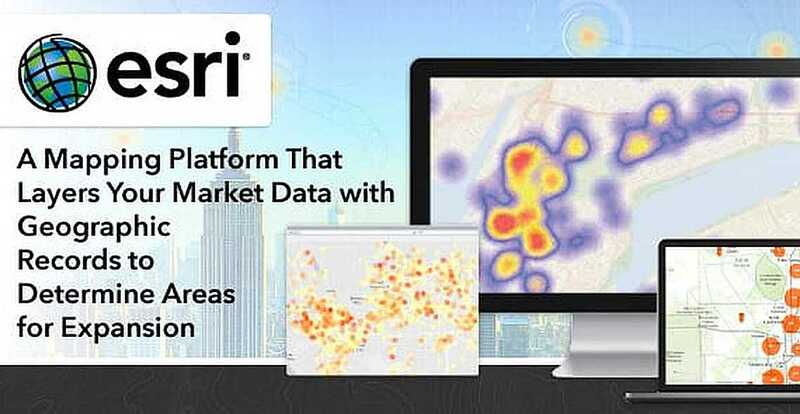 Esri helps take out the guesswork by allowing retailers to quickly analyze a vast amount of data about potential customers and target demographics by using spatial data and geographic information. Retailers looking to expand their markets have to move with speed and precision to be successful. Sometimes, decisions have to be made before a competitor gets a step ahead. But those decisions must also be correct, or a location can underperform because not enough market research was done beforehand. 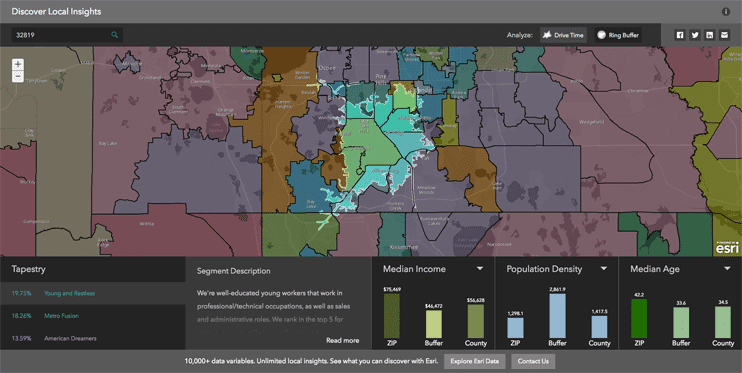 Layering demographic data like income, age, and lifestyle to make decisions on prime locations for expansion can create the highest ROI for retailers. And the ability to move expeditiously — and with confidence — on that information makes Esri an important tool for businesses no matter what the rate, or reach, of their expansion. Esri allows retailers like Wawa to accomplish their objectives through customizable geographic data analytics. Wawa leveraged Tapestry, Esri’s proprietary segmentation tool, to spatially understand where target customers reside, giving the company a clear picture of where to expand. “They found that not only had a lot of their customers relocated down to Florida, but also — from a demographic and segmentation standpoint — there were a lot of target customers in the state,” Gary said. During the market planning process, numerous factors come into play, including store location, competitor proximity, and population characteristics. All of that information can be layered through Esri to produce an insightful, interactive map that gives a retailer a more informative picture. Through Tapestry, a business can import its own customer data easily and has access to a rich information set from sources including the U.S. Census. Finding markets for new store locations is just one aspect of Esri helping retailers with expansion; another is enabling businesses to make informed decisions quickly. Sometimes, an opportunity presents itself to a retailer in the form of a broker pitching a location for sale or lease. In that scenario, processing data, ROI, and even traffic patterns can become a time-sensitive issue. Esri provides retailers with robust data so they can make decisions on market expansion quickly and confidently. In those cases, Esri speeds up the process of analyzing a trade area — looking at road networks, public transportation, and other retailers in the area — to understand the segments around the store, where competitors are, and model what profitability can be expected. That means when a company’s real estate committee meets, it can make faster, more data-driven decisions. Esri is designed to be used right out of the box by anyone who wants to harness the platform’s broad capabilities. Whether a business owner majored in GIS in college or knows little about the process, the platform works for any retailer. Retailers also know that with proprietary customer data comes a responsibility to keep it safe. Esri has data security in mind, as well, and the platform is adaptable to any internal security policy. With a hybrid strategy, security-minded retailers can layer their locally stored data with Esri maps in the cloud. A hybrid strategy is what many security-minded retailers choose, meaning locally stored customer data can be layered over Esri maps in the cloud without the two having to be attached or associated. This analysis can be done quickly in a browser while all of the consumer information is safely stored on local servers, giving retailers security and flexibility. Retailers of any GIS knowledge level can use Esri’s ArcGIS platform immediately and comply with any security protocols they currently have. But Esri has bigger plans for its spatial data capabilities, and they involve mapping much smaller terrain: the inside of retail stores. Esri has had an enormous amount of success helping retailers like Wawa expand, even into markets far from their home territory. Wawa opened its first store in Florida in 2012, and now has over 100 locations and counting with the help of Esri’s platform. But companies are also relying on Esri to help capture insights inside their stores. So Esri is bringing its powerful platform indoors to help stores learn from store traffic patterns to improve merchandising and marketing. Knowing where customers travel within a store leads to insights that impact important decisions. Esri is working on some innovative ways to track store flow patterns and even help customers navigate stores to find the items they are looking for. That means Esri can help a retailer even after a location has been selected. As the adage goes, three things matter in property: location, location, location. With Esri, a retailer can find the right location, act on geographic data quickly in acquiring that location, and even deal with the location of customers in the store once it is built.